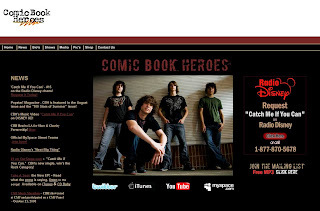 You know, with a name like Comic Book Heroes, you'd think a band's visual identity would at least vaguely reflect -- oh, I don't know -- comic books? Why do they need to adopt a literal interpretation of the name they chose? Kids like comic books and they're kids..and kids like them! Good thing the Red Hot Chili Peppers and the Beatles didn't go that route!